With the assistance of our highly skilled professionals, we are able to offer a premium grade Plough Shear Mixer to the clients. We carry out our operations from Maharashtra, India. These are easy to install and demand the least of maintenance cost. We offer it in various specifications, to cater to the variegated industrial requirements. It is completely at par with the predefined industrial standards and norms. We are competent to take bulk orders for it. Detail : Plough Shear Mixer is suitable for mixing of ointments, inks, sauces, pastes, foam, used in the Pharmaceutical, Food, Chemical, and allied Industries. The mixing blades revolve in the opposite direction to sweep the entire circumference of the vessel as well as rotate around its own axis. Intimate mixing is achieved in short intervals. The mixing elements are raised vertically by an electric or hydraulic lifting or lowering arrangement. 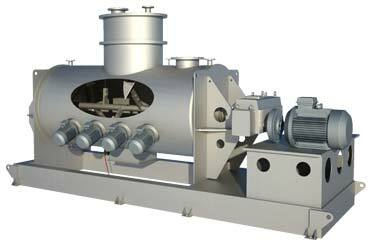 The vessel can be removed and the next batch can be kept ready for the processing in these Twin Shaft Dispersers.